Home › CLI Updates › What’s the highlight of your summer? What’s the highlight of your summer? 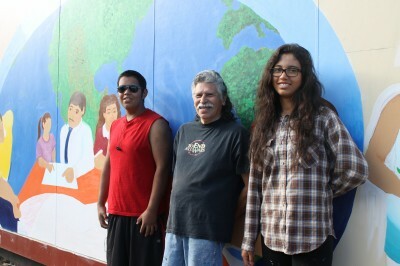 This summer I had the pleasure to spend an hour with Maria and Antonio about three days a week while I drove them from Salem to Woodburn so they could have the opportunity to paint a mural that tells their story. It’s been the highlight of my summer. Antonio (15) and Maria (16) are brother and sister. They live in Salem, Oregon, but are originally from a small village in Michoacan, Mexico known as Los Reyes (The Kings). immigrated to Oregon at a very young age. They live in northeast Salem where I grew up and both our parents are farmworkers. They also pick berries every summer as I did at their age and finally, they go to McKay High, the school I graduated from. like to be an artist. Antonio, who won a writing contest in middle school, wants to be a writer. “And what about working with Juanishi or sensai as you call him? What’s that been like?” This was my last question to them. “Juanishi is a lot of fun. He has a lot of great stories. He’s like another young person, but he has the authority and respect from everyone,”—commented Maria. “Juanishi is the only older person we have a relationship with. We have one living grandparent but he is back in Mexico and we never got the chance to get to know him,”—said Antonio. Now we are just a couple of weeks away from finishing the painting of the mural. Who would have thought that the most valuable thing we were going to create was not just a mural, but true relationships. Thanks for the ride Maria and Antonio. ← Have you seen it?